This coming November 11th is the Centennial anniversary of the Armistice that ended the Great War (World War I). 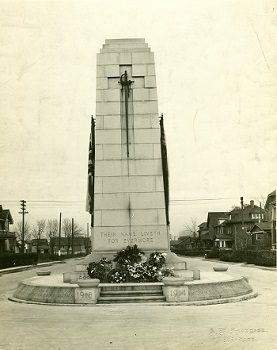 This photograph was taken in 1925 of the Windsor Cenotaph which was located on Giles at Ouellette Avenue. The Cenotaph was unveiled November 11, 1924. In 1965 the Cenotaph was dismantled and moved to its current location at City Hall and was rededicated on November 11th, 1965. If you would like to view this our other historic photographs of Windsor, please visit the library’s digital exhibit “Windsor, History and Pictures” at http://heritage.windsorpubliclibrary.com/index.php.